I just got surprised by this unbelievably beautiful box of Belgian chocolates as a thank-you for organising a trip for Belgian tourists to SA. I’m blown away by the detail, now this is what I call packaging! 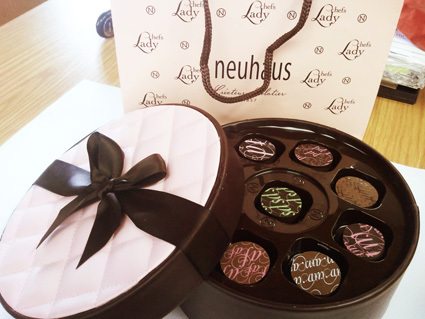 Neuhaus, according to their website, is the “inventor of the Belgian praline”. An accomplishment right up there with penicillin, to my mind… Well, colour me impressed! PS, apologies for the horrible picture with the stapler and the in-tray in the background and the fake wood laminate, but that just proves to you that I’m really at work. Which is what I should be doing. So cheers. Posted in Design inspirationTagged design; pretty thingsBookmark the permalink.